Woodhead Education have delivered a sector leading “Ingenuity Centre” which will house the next generation of entrepreneurs and innovators. It was opened by the Rt Hon Jo Johnson, Minister of State for Universities, Science, Research and Innovation. 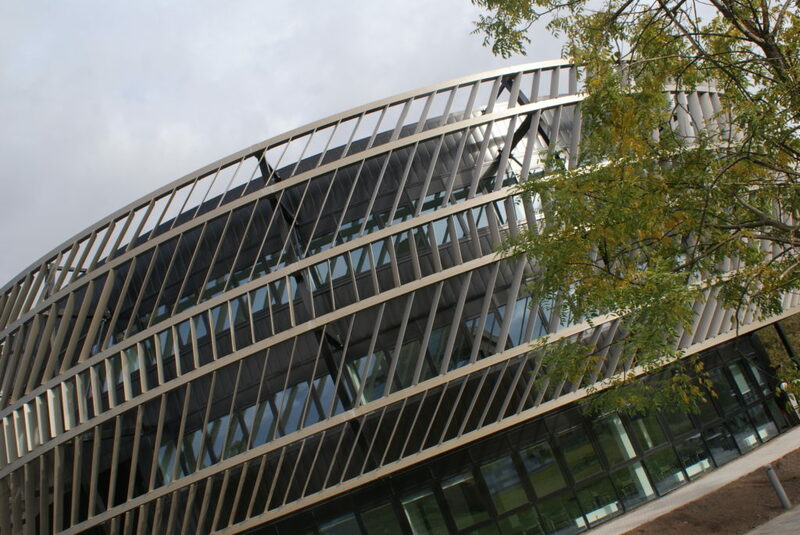 The Ingenuity Centre as it is known, is a 2,000m2 three-storey building based at the University of Nottingham Innovation Park (UNIP). As the focal-point of the University Enterprise Zone, it provides office-based accommodation for technology-driven start-up businesses and early-stage SMEs, from the local business community and from within the University. The Ingenuity Centre will support businesses which operate in sectors of key local and national importance, such as Big Data & Digital, Advanced Manufacturing, Aerospace and Energy. The aim of the Centre is to create 50 new businesses by 2019, generating 350 new jobs and delivering a combined turnover of £25m by 2021. Designed to reflect the local industrial heritage of the area surrounding Innovation Park, the architecture of the Ingenuity Centre, which is based on the shape of a tyre, honours the Raleigh cycles factory, which dominated the Triumph Road site from the 1930s until the end of the 20th century. The building cost £5.2m to develop, half of which has been received from Government as part of the University Enterprise Zone programme. The University of Nottingham is one of only four universities in the country to have been awarded enterprise zone status. Speaking about the opening of the new centre, Universities and Science Minister, Jo Johnson, said: “Our universities are world-renowned for ground-breaking research and innovation in a wide range of areas from satellites and advanced manufacturing to robotics and driverless cars. Professor Sir David Greenaway, Vice-Chancellor of The University of Nottingham, said: “We are delighted the Minister for Universities, Science, Research and Innovation, will be opening the Ingenuity Centre for us. A number of small businesses are set to move into the Ingenuity Centre, these include eight which are part of a pilot incubation programme funded by the UK Space Agency. Over an 18 month period, the businesses will receive access to free, high quality office space in the building, as well as support services to help them develop and grow. Other tenants moving in include a business established by a graduate of the Ingenuity Lab, called ‘Live the Go’ and another which develops software for clinical trials.